Everyone has things to do, and we do them all the time without having to be reminded or prodded. However, from time to time, you can realize that you have dozens of things to do and keeping everything straight can be a nightmare. These things could be like planning a child’s wedding, preparing for a family reunion, chairing some charitable event or being involved as an officer in some civic organization. All of these events and many more require a lot of things happening at the right time in the correct way if the event is going to be successful. The “My To Do List” is the tool you want to have. This is a simple organizational template, built on the Excel platform. It prompts you by identifying which task is completed and those that are still waiting to be completed. It also shows the priority level assigned to the various projects. The word is in red, and the background is pink. You are not going to overlook it. Next, you give the task a name. You can assign a number to each item or some other means of identification. The next column asks for a description of the task. This will help remind you if there are any special things required for this particular task. The status column is where you can write whether the project has been started, not started, in progress, incomplete, needs corrections, modifications requested and so forth. 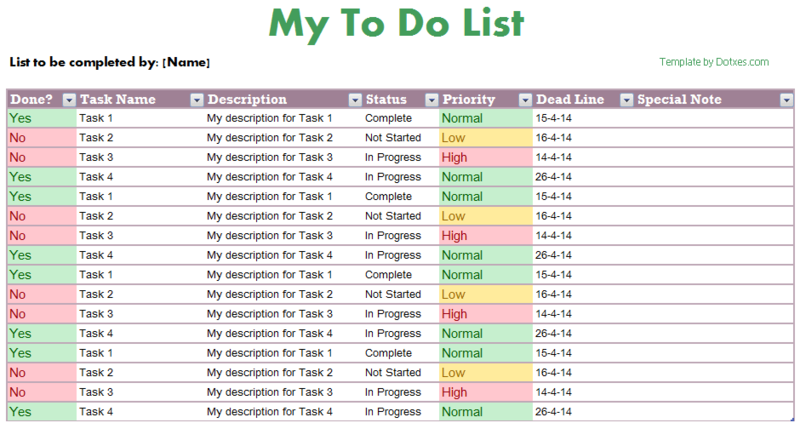 The next column lets you prioritized by assigning a priority level of normal, low or high. After that, you have a place where you can note where the project must be completed and then a column for any special notes about the project. The list will not do the project for you, but it will give you a guide for remembering which projects need to be done first. The chart will also show which projects can wait unto later. It will also let you know if something needs any modifications. Of course or other committee, family or team members have to fill in the blanks. The chart will do a lot of things for you, but you are responsible for inputting the needed information. With all the data entered on the chart, you can then sort the data as needed to group the high-priority items together, follow those with normal or low priority status. The “To-do list template” is a handy tool for special events. However, it can be used for other purposes such as household chores. Instead of entering a description, the name of a family member can be inserted. The chore can be identified in the “Task Name” column followed by a few words in the “Special Note” column for those who need some reminders. The “My To Do List” is simple to use and is a great way to organize events and keep track of the progress of each activity or household chore. Funnily enough, I liked seeing the due dates of jobs. I hadn’t realized I had so much time to finish them – I kept thinking I had to do them today or this week !!! But I have at least four weeks (silly me) to finish the major “to do” items. Excellent template with lots of good features Thanks.